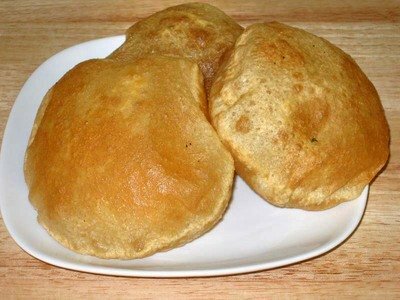 This puri recipe is the origional and the best. Puri comes under the heading of 'Deep fried bread' which to me, sounds disgusting but it's not. Indian people do love there deep fried food and they sure do know how to cook it. This recipe is enough to make about 12 Puris. Mix the salt, butter (ghee) and flour and rub togerther untill all of the butter is absorbed. Add the water slwoly and using your hands knead the mixture untill it forms a tough dough. Add more water if needed. Put the dough onto a floured surface (flat and knead for about 5 minutes. Cover and leave for 15 - 20 minutes. Re-flour the board or surface you were using and take of small pieces of dough. They need to be then flatterned untill they are about 10cm across. Puris need to be shallow fried so fill a deep frying pan with vegetable oil (not all the way to the top please)! Heat untill about 170°C. Drop in your freshly flattened puris and using a spatular or fish slice, press to the bottom of the pan for about a minute and then turn over and do the same. The fry for about 1 minute and let the Puri puff up and go brown and then it is done.